I don’t get St. Patrick’s day. I really don’t. . . Of course, I’m not Irish. But then again – good ol’ Patrick wasn’t Irish, either. I’m also not a Catholic. Pat was, tho. Fer sure! I think you kind of HAVE to be a Catholic to get sainted and all. . . ‘s like a law or something. It seems to me that the Irish people maybe ought to be a little bit upset by the whole thing, really. I mean. . . Good ol’ Patrick basically destroyed their culture and re-created it entirely, omitting loads of the awesome bits, like, um, DRUIDS! I mean, three cheers for Christianity and all, don’t get me wrong, but druids rocked! Those dudes got to run around all half-shorn with hoods and cloaks and magic and stuff. . . change is what it is, but you shouldn’t just go around erasing a people’s history and culture like that. ‘s not very nice. But then. . . maybe that’s exactly what they’re celebrating? Maybe the Irish didn’t actually like their culture in the first place and were glad to see it go? But if that’s the case, shouldn’t they be celebrating by being all pious and going to church instead of getting blasted at the local pub?! Maybe the celebration is different in Ireland than it is here in the states? I also don’t really understand why 99% of the people I know who ‘celebrate’ this holiday are non-Irish non-catholic alcoholics. . .
Maybe I’m just too Italian to get it?! I like the color green, and my husband is Irish. He came complete with a coat of arms and a hideously ugly plaid and a kilt and everything. And so, by default, Wonder Puff is Irish-ish, too. 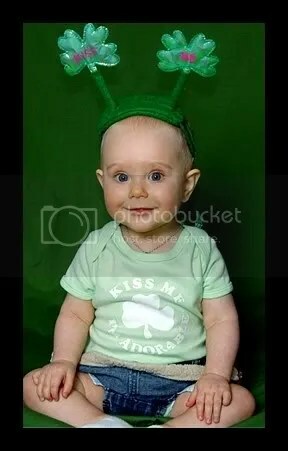 So the very least we can do is teach her a little bit about her heritage and let her wear wobbly sequined shamrock antennae on her head! 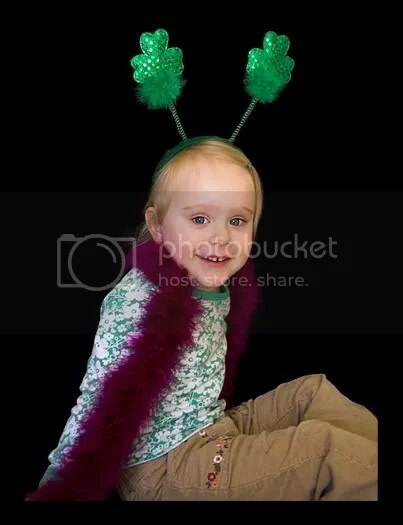 THREE CHEERS FOR WOBBLY SEQUINED SHAMROCK HEAD-ANTENNAE! And I’m too tired to get into all the fun St. Patty’s day stuff we got to do, like going on clover-hunts and painting things green, (you’d just be jealous anyway) but I will tell you that even though our celebrations did not in any way involve alcohol or rosaries, Teagle had a wonderful time dancing to fiddle music, and that a highlight of her ENTIRE LIFE was finding the (hollowed-out-lime) pot of (jello) gold at the end of the (jello) rainbow (twice. and we still have left-overs). 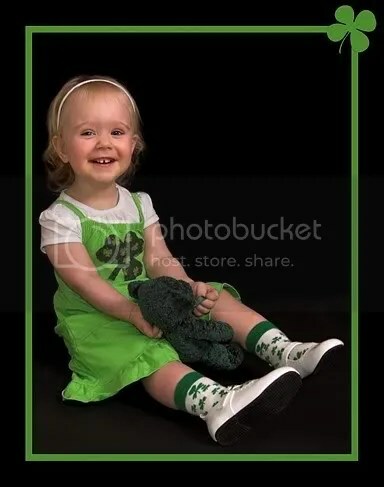 And, just because she’s always been so darn cute, I’m going to share a few pictures from T’s last St. Patty’s day. . .
and the one before that. . . Puffy’s FIRST Patty’s! Hope you’ve had a happy day! 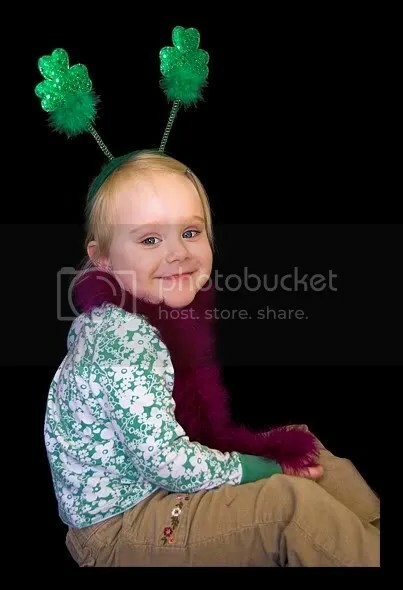 WOBBLY SHAMROCK HEAD-ANTENNAE RULE THE UNIVERSE??!!! Love the 2nd pic of her. So model! 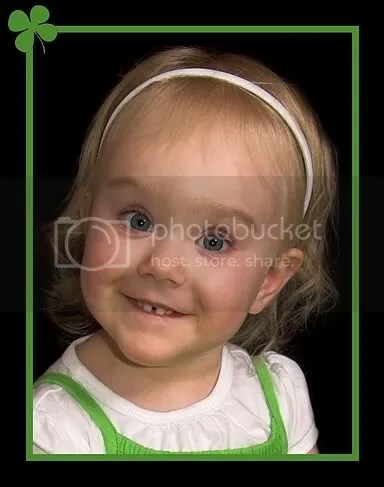 She has a very kiddy face. Also– that jello rainbow is boss. I probably wouldn’t eat it (except for maybe the RED), but it is a work of art. You are awesome! 😛 I agree with Ki and I thought the same exact thing when I saw it, that second picture is so model-like! She looks all grownded up. Sigh. And AHH! 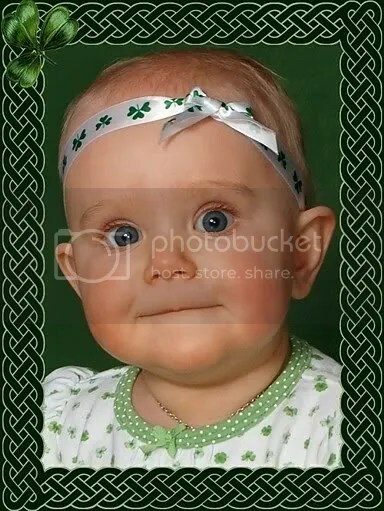 You just reminded me that Kearsti won’t be able to wear her dress for St Patty’s day. 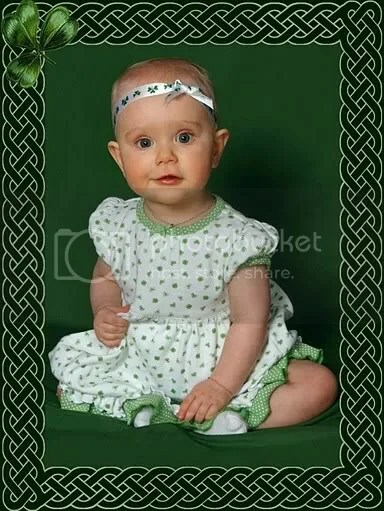 Sigh…We have the same white with shamrocks on it dress. Shamrock wobble things are the greatest. any headband that has stuff wobbling off of it is great! 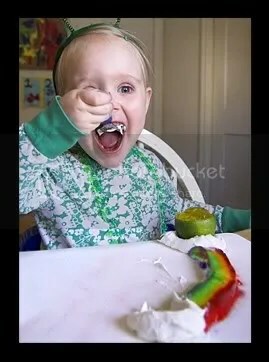 That Jello rainbow looks delicious! Yum. I’m all Irished out. Some of my kids went/go to a high school of Fightin’ Irish here, and it’s shamrocks for everything. I think the St. Pat’s day popular celebration is analogous to the Easter Bunny in terms of cause and effect. Loved your idea of hollowing out a lime and filling with jello. And the rainbow. Lots of folks my age would like that. Will it jell in the shell or do you have to cut it and put in just before serving? I really don’t get it either!! But, at least you can get Puff dressed up in green and have beautiful memories forever!! How cute! I’m lovin the old pics!